One of our comfortable adjusting rooms. During the typical office visit at Wood Chiropractic you will simply sign in and be greeted by one of our wonderful staff members. 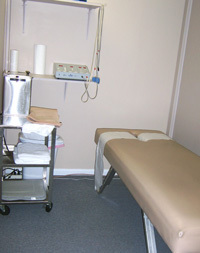 At this point our staff will begin preparation in making your visit with us an enjoyable and relaxing experience. The typical visit averages 20-25 minutes from entering to exiting depending upon your care plan. As with any health care provider please remember that emergencies do occur and from time to time schedules are disrupted.